As the 2010 Formula 1 season has methodically drawn to a conclusion with four events still left to run, the freshman efforts of Virgin, HRT F1 and Lotus Racing remains in their own, slower class. In fact, not one car from the three before-mentioned team has even finished in the top-10 of any Formula 1 event. Running spec Xtrac gearboxes and identical Cosworth engines, these teams can operate on a lower-budget but A tough deal for any hard-working auto racing team to accept season-long, the structurally-strongest member of the freshman contingency of Lotus Racing is already planning a radical shake up for 2011. Having announced just recently the adoption of the 'Team Lotus' moniker starting next year, the Formula 1 organization has also been shopping for some new competitive hardware, namely an all-new engine. 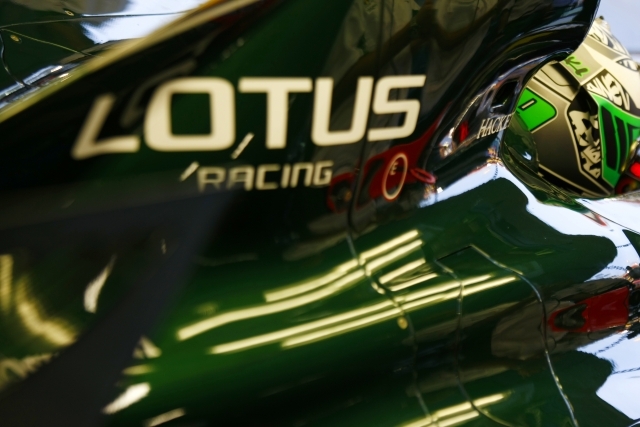 Late last week, Lotus Racing powerplant change for the 2011 season was confirmed as the team and Cosworth confirmed a break up following the 2010 Formula 1 tour. Replacing Cosworth, questions on what engine manufacturer will supply the British racing green and yellow cars with power has fingered on the French automaker Renault. Today, the Renault engines for 2011 seems all-but guaranteed through an indirect announcement relating to transmissions and other components. On their official Facebook site and Twitter, Lotus Racing presented a mild bombshell implying current Formula 1 constructor championship points leader Red Bull Racing will supply gearboxes and hydraulic systems to their efforts next season. Since Red Bull Racing runs Renault engines, it seems natural that Team Lotus will try to stay consistent with the dealer team. Refurbishing their on-track commitment to Formula 1, this accompanies Lotus Cars' flashy appearance at the 2010 Paris Motor Show. Indeed, we should expect some big things from the once world-class sport cars builder.